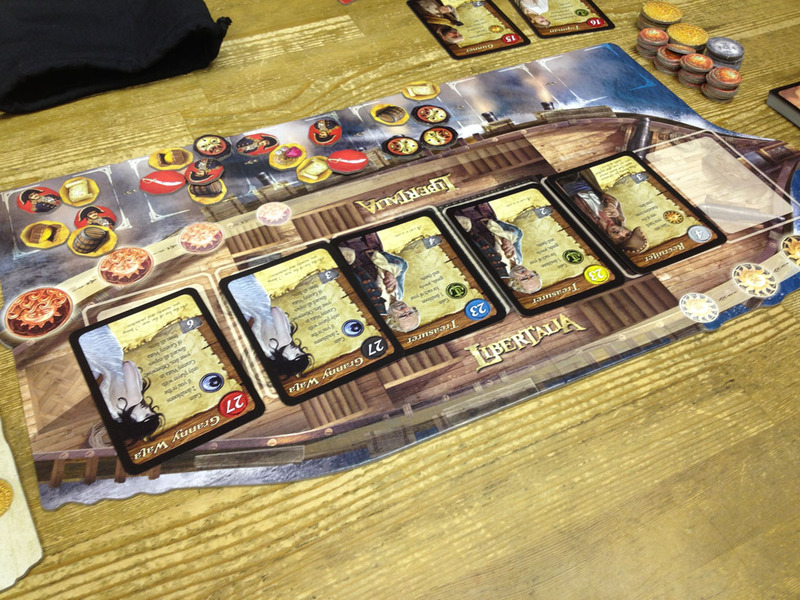 Libertalia is by Paolo Mori who designed one of my favourite games Vasco de Gama. 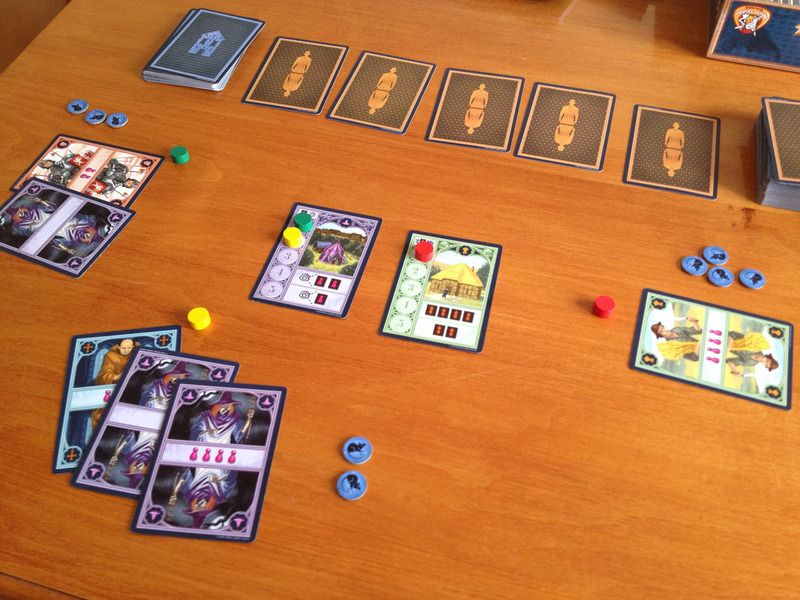 Libertalia is a very different game to Vasco de Gama as it is a simple and relatively quick, card-playing game. Players are pirate crews who are trying to earn the most doubloons buy collecting booty. Each player has a set of 30 cards each representing a crew member with a value (1-30), a special ability and a tie-break number. Each player’s set of cards is the same except the tie-break numbers are different so that no two cards are exactly the same. Each card’s special ability states if it will be used in the day, at dusk, at night, or at the end of the campaign. To start the 1st campaign, one player randomly draws 9 cards from their deck, then all the other players draw the same cards. 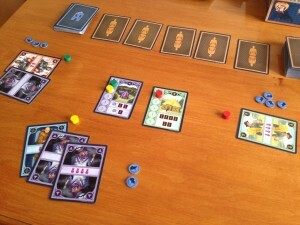 Rialto is yet another of this year’s game by Stefan Feld (which is a good thing as I like most of his games). 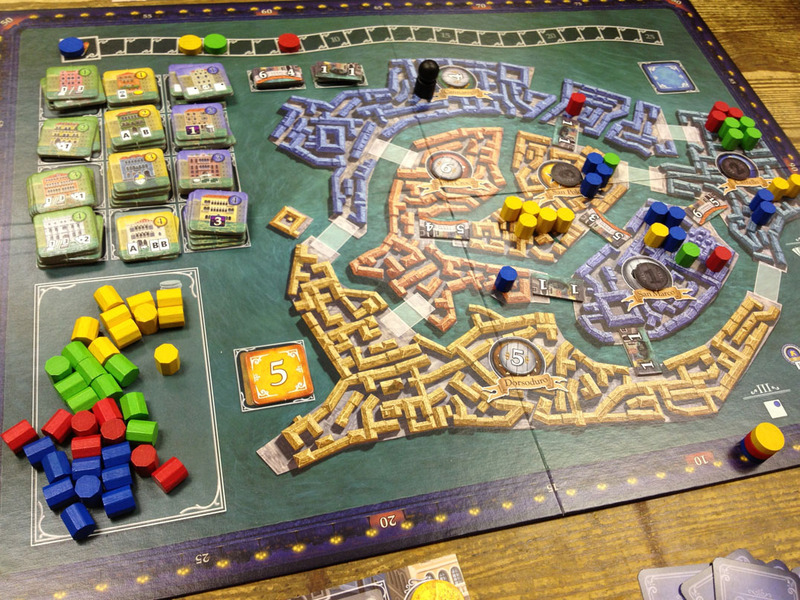 Set in Venice, Rialto is played over 6 rounds – one for each of the Venetian islands on the board. Players are aiming to score the most victory points (VPs) which are primarily earned by having councilors on the islands at the end of the game. Players each have a marker on the Doge track and this splits all ties and determines some order of play. Each island has 1 connection to each of its 4 neighbouring islands. 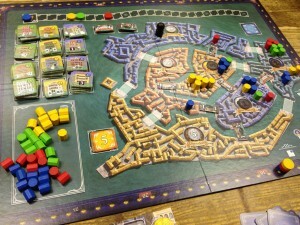 During the game, these 12 connections each get filled with either a bridge or a gondola token. Each bridge and gondola token has two values on it (one on each end) – bridges have values between 3-6 VPs; whereas, both values on gondolas are always value 1. This is important because the final VPs gained by players with councilmen on each island are based on the total of each island’s 4 connections’ values.